The Tumblr known simply as The Worst Cat reads like an angry letter from a parallel universe. It chronicles the confused, enraged response of one person to the emergence of a "popular breed" of cat that is just too shiny, moist and sticky for her taste. No really. You have to read it now. Some people have been saying that these are not cats. I understand wanting to believe that. It's like wanting to believe that racism is over. We all want to believe that the world is a better place than it is. 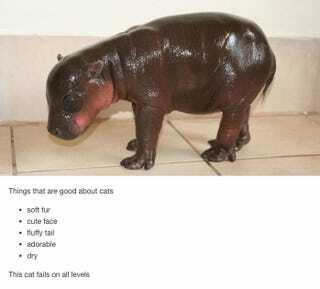 However, it is clear that what you see here are in fact cats.They are just not very good cats. I think what I like most about The Worst Cat is that it feels like it's coming from a weird alternate history scenario where somebody decided to breed hairless water cats. And one woman is brave enough to speak up and say that there's something wrong with that. There was a moment last night when I was reading this Tumblr and I laughed so hard I think I might have peed a little bit. Read the whole thing and have a better day than the one you are having currently.